TICKETS PLEASE! 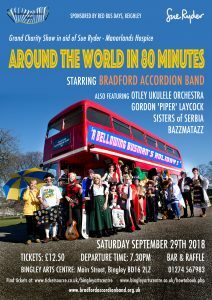 Only 17 days since we went live with “Around The World in 80 Minutes” in aid of Sue Ryder- Manorlands Hospice and more than 70 (of the best) tickets are already sold! So, please don’t miss your seat on our energetic, unforgettable journey of live music, song and dance from across the globe. Featuring special guest stars: the stringworthy “Otley Ukulele Orchestra”, the sublime “Sisters of Serbia” and the inimitable “Bazzmatazz”!